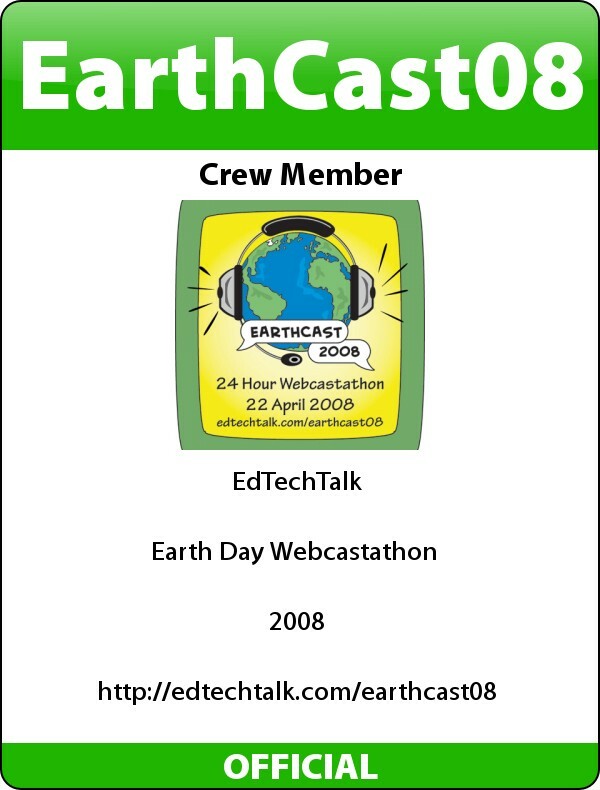 The Digital Down Low: Earth Day 2008 Webcast-athon! Earth Day is on Tuesday, April 22nd, 2008 this year. In today's Webcast Academy class of 2.4 meeting, we briefly discussed the possibility of doing some type of webcast-athon as a means to recognize and celebrare Earth Day 2008 around the globe. The idea involves a 24 hour conversation about an issue that every person on this this planet has a stake in-the health of our planet. 1. Ideally it would be nice if we could webcast for a 24 hour time period throughout Earth Day as it moves around the globe. Different people in different parts of the world would sign up for an hour long block as the lead moderator. In that hour long block they would moderate conversations with special guests. 2. Guests could include scientists, engineers, student leaders, parents who are passionate about environmental issues, teachers, local business owners, local grass roots environmental leaders, scientists in Antarctica, experts in the field of clean energy production, politicians, polar explorers, corporation sustainability representatives, etc. The sky is the limit to who could possibly participate. 3. I'm guessing that the conversations would mainly take place in English, but who knows, maybe this isn't necessary. The idea here is to get a world view on environmental challenges and solutions. 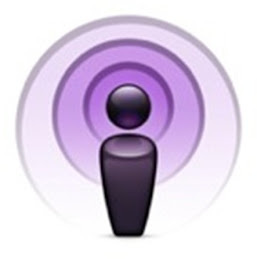 If the conversations can't be in English in certain regions, perhaps that is OK and they can be transcribed into a document that is posted in the show resources (I have no idea about this as I'm very new to webcasting) . 4. All moderators should most likely either be interns or past interns of the Webcast Academy. I'm guessing we'll be streaming out via the shoutcast server at World Bridges, so it only makes sense that the lead moderator be a past or current intern. 5. If you are not a current or past intern at the webcast academy, there still will be many options for you to participate. You could co-moderate one of the hours, help with getting guests to be interviewed on the Earth Day 2008 Webcast-athon, help promote the event through your various networks, etc. 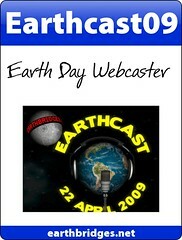 I look forward to your comments and suggestions on ways we can best implement the Earth Day 2008 Webcast-athon. Likewise, please let us know if you are interested in participating in any capacity whatsoever! Photo courtesy of arimoore on flickr. i think this is a good idea... it could certainly help jump start a lot of conversations with a lot of different people. environmental concerns are important worldwide. 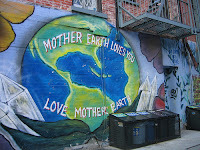 Sounds like a great idea and I'm definitely interested in participating in the Earth Day Webcastathon. Thanks for a great idea Matt! Thanks, Will. I think we could host an hour of the webcastathon from USM. Doug-excellent...glad you're interested in participating. We'll have to talk it up a bit in the webcast academy class of 2.4 meetings to try to get some other participants involved. I'm hoping we can get different moderators from different regions of the world sharing their stories about what is being done locally and their global concerns. I know some interesting things are going on in Vancouver and I look forward to hearing some of those stories! Exciting idea, Matt. You may already be in touch with Clay Burell about Project Global Cooling---student-organized concerts to raise awareness about climate change, all taking place at various sites around the globe on Earth Day 2008. If not, consider joining forces with Clay for a spectacular mega-webcast. This is a great idea, Matt. Let me point this to my PGC high flyers and what, get them in touch with you? Great idea Matt. I'm following your comment from Clay's site. Let me check out the technical stuff on my end. Things can be tricky here in the Dominican Republic sometimes (power failures, slow connections...) but sometimes things do work. Love the idea and would like to help from Israel. 6th Grade Conference w/Wesley Fryer!